With the aid of large drinks they intend to release what they consider the best rock'n'roll and soul from around the globe. With exception of Scandinavia, they leave that up to Bad Afro. The first release is with "the scariest band in the world". No kidding. Deadbolt from San Diego have 6 albums out (all worth tracking down) but this is their very first vinyl 7" release. 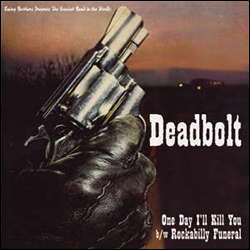 The title track "One Day I'll Kill You" is taken from Deadbolt's latest album "Hobo Babylon" while the flipside "Rockabilly Funeral" is exclusively recorded with this release in mind. Ewing Records proudly presents two of Denmarks finest bands ever. The Defectors and Baby Woodrose are nothing less than pioneers on the danish musicscene...what the hell...on the musicscene world wide! They´re the kind of bands who are taking no crap from the man. Who doesn´t care about this week trends or hit-list placements. The kind of bands mothers hate and daughters love! They do things their own way! They play loud, live hard and listens to a lot of sixties garagerock. 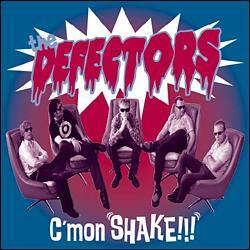 The Defectors has pleased crowds all over Europe and they are going to please you with shakin´ treat of a song. "C´mon Shake" and do the monkey with The Defectors. They won´t let you down!! 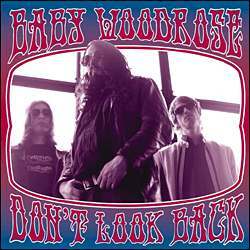 Baby Woodrose blows minds for a living and this track will blow yours for sure. Their cover of this Lollipop Shoppe gem is acidpunk at it´s prime. So "Don´t Look Back" mista, all you need is right here, right now! JR and I are sure glad we moved our business to Denmark, ´cause the beer is great, the girls are goodlooking and the bands are fantastic! !